. . .even Ella, my 3-month old niece, is wowed by the low, low prices she’s seeing in the new catalog! It only seemed like we broke the bank there a couple months ago when we furnished large chunks of our library, media center and balcony, but the final price on that receipt showed some amazing savings. Looking forward to heading there this Sunday! 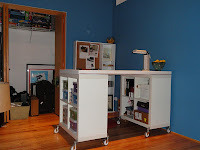 Check out the IKEA Hacker blog for mucho inspiration for your next IKEA trip! We had a busy busy weekend, including kayaking the Chicago River. Looking to take it easy on Sunday night, we browsed our game shelf in the closet and decided to do a puzzle - we are indeed an 80-year old couple. And so, after 3 nights of working on the puzzle we neared the finish line. We got skunked when we got down to the last piece and found ourselves with two spaces left! A quick search around the table and even the plastic bag it came in. - yes, Bob went through the garbage to try to complete this puzzle - turned up empty. Much like the Sphinx with its missing nose, our puzzle too was "less than." As we worked on that 1000 piecer, I thought about how you could decorate with a completed puzzle. . . The easiest way to decorate with one is to frame it and slap it on the wall. Bob actually has a glued together puzzle of Rome that we are going to be putting on the wall in our guest bedroom (a small hint on the theme, stay tuned in the next couple weeks for that completed room!). Taking it a step further, you could take a cue from this Mozaikit art idea and make your puzzle a little more "reckless." Undo your hard work by taking apart a corner of the puzzle (keeping the pieces in as much order as you can) and spread them out from the puzzle. Glue the whole thing on a canvas or a mat within a frame. 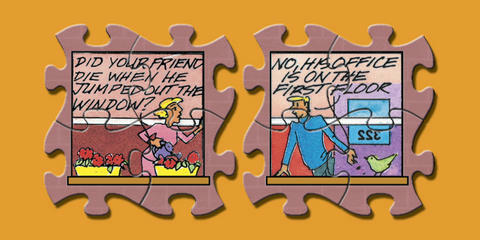 Puzzles are made more difficult when there is a large background area that is all the same or similar colors. Take advantage of this open space and create a multi-hole picture frame. 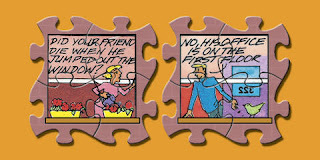 Complete the puzzle - that's the hard part - and then break out picture size squares or other shapes. Glue or tape in a series of pictures that can go along with the puzzle's theme. Unfortunately, my travels have yet to take me to Egypt, so I am not able to fully realize the potential of this puzzle. Some random shots from Hawaii make sense, right? So there are a couple ideas for keeping your puzzle alive. Possibly more appealing than immediately breaking it apart and putting it all back in the box to be pulled out on another lazy Sunday. I loved doing puzzles when I was younger and got nostalgic for my favorite type. I had 2 or 3 of the "Talking Jigsaw Puzzles." The premise of these was that every piece fit together and the theme would be locations like an Apartment Building or a School. Fitting together each set of four pieces that made up a window was the easy part - you then had to use clues from the conversation bubbles to figure out placement of each square. Once you were done, flipping it over would reveal the word "Congratulations" written out over and over again so you could make sure you had done it right Doesn't look like they make these any longer, but I did find one on Amazon for. . .$82?? Crikey! Maybe I should have kept mine for some potential eBay action. . . When we were looking for a place to live, a patio area of some sort was a necessity because Bob owns a gas grill. We couldn't believe how much we lucked out with the balcony at our new apartment! Not only was there room for the grill, but also for a 4 person table. Quite the luxury in Chicago. There were a lot of big sales around memorial weekend on Target patio sets, but as good as $100 for a 5-piece set sounded, the looks just weren't quite right for us. We found our table for 40% off at IKEA in early June ($60 instead of $100), but we were not sold on the chairs that came with it - or their price of $60 each. After much google searching, I stumbled onto defysupply.com. Mainly wholesale furniture for restaurants with minimum numbers for ordering, the chairs on this site had the nice price of $43 each with a minimum order of 4 chairs. Also, FREE SHIPPING! We liked the look of these stackable chairs as they not only had the wooden slats that matched the table, but also the chrome element. Now that we have them, I can't help but notice a lot of outdoor seating at restaurants seem to have the same style! One note if you are ordering from this type of site: while they were a cheaper option than much of what we liked in stores, and the shipping meant we wouldn't have to figure out how to fit 4 chairs in Bob's little two-door, I read the fine print AFTER I ordered: 6-12 weeks for shipping! I thought we would have them in time for our housewarming party but no dice. All in all, they arrived in about 8 weeks. One item that is not part of our balcony (yet?) is an outdoor rug. After an informal poll of family and friends, I seem to be the only one who sees this as a good addition. I believe the responses I got ranged from "what's the point?" to "sort of useless." I suppose I don't really need to define the grill space from the dining space with a rug under the table, but I sure do like the look - and price - of this one to the right or of this one from World Market! What do you think about the outdoor rug? Frivolous or Fun? This little table grew on me while I stayed at Bob's place the month of May (my transient days between having to be out of my studio and us moving into this apartment). His TV sat upon this well-worn table that, if I am not mistaken, was a curb-side find of his back in Denver. My initial reaction was a resounding "To the Dumpster With You! ", but the more I looked at it, the more I liked it as a patio table to hold plants and our gardening supplies. We've talked about painting it, which might still happen, but in the meantime this "little-table-that-could" is growing on me. . . The bottom shelf holds our beverage tub, leftover potting soil and watering can. You might recognize the $1.99 watering can from IKEA catalogues, but I actually found this one at Home Depot. If we had any more plants, I would spring for a bigger size, but this little guy does the trick for now! For my birthday this past June, my mother brought down 3 potted herbs to get me started. We've got thyme, basil and oregano on the top of the table. I've gotten the most use out of the basil, but we recently used the oregano in a salmon dish and I've been on the look-out for recipes that call for thyme! I think next season we'll start on cilantro and keep the salsas coming! One time when I was in college I woke up in the middle of the night, sleepily walked to the fridge because I was thirsty and took a big swig straight out of my new bottle of apple juice (something I do not condone under normal circumstances - get a glass!). To my tastebuds' surprise and dismay it was not apple juice, but white grape juice! I have a horrible habit of not reading labels when I'm at the store, throwing things in my cart willy nilly because they look like the item I want to buy. Why do I tell this story? Because I did it again when we were buying our plants and flowers! Our Home Depot trip to the Garden Center involved putting a lot of random plant life in our cart because we liked how they looked. If you check out the potted plant on the patio table, you may recognize it as a Hosta - which is supposed to be planted in the ground with at least 24 - 36 inches of room for it to grow. Oops. We'll see how long I can keep the poor thing alive in a pot. It did just start to flower - that has to be a good sign, right? Our planters are filled with, among other varieties, marigolds and geraniums and have been doing pretty well overall this summer. I am definitely looking forward to next season when we will go into the Garden Center with a little more research and planning under our belts. While having some plant life, albeit a mismatched array, is a nice addition to the home, I always get a little jealous as I walk up our sidewalk and see the coordinated displays of our neighbors. Ah well, just call us eclectic! Although I own a few cookbooks and had a 12 month subscription to Cooking Light, a lot of the recipes I make come from the internet or are passed along via email from friends. Because of this, I've amassed a binder full of loose paper that is in no particular order and with each use the pages get more grease stained (even if there isn't greasy stuff in the recipe, how does it do it?). Step 1 would be securing the pages to the binder which might work if I ever remembered to bring my three hole punch home from the office for a night. Even then, I would still have the issue of unprotected-from-spills paper and the mish-mash of copied magazine pages, printed off word documents and emails which is not fun to look at. So, I decided to compile a Recipe Book! First, I went through all of the recipes and tossed the ones I knew I would never consider making or perhaps had tried and given it a thumbs down. This gave me about 45 recipes to record. I bought a photo album at Michaels along with a re-fill pack right away since the original only had 10 pages front and back. After adding the other 10 to the book - and needing to punch new holes in order for the pages to match up with the book, oy vey - I had 40 pages to fill up! Although I don't keep a traditional sized scrapbook, the pads of paper you can buy for them always have such great patterns and work really well for the cards I make. I picked out a few pages and started cutting them up in random patterns sized for the otherwise white and blah pages of the recipe book. Once the pages were all created, I took recipe cards bought for $1 at Michaels and wrote out the shortest recipes I had that would fit on one side of each. The rest I typed up in font size 10 to maximize space on the pages. The recipes were categorized as: Sides and Starters, Main Dishes, Desserts and Beverages. I'm still hemming and hawing over adding tabbed pages, but at this point the sections are pretty easy to figure out. Along with the backgrounds, the pages needed a bit of a kick, so I was glad to have some vintage style stickers on hand that I snagged from my Aunt Christine. The alphabet stamp set I have also comes in handy for these types of projects. If I make something new and it turns out well, I take a picture of it. One might say, "Did you really need to take a picture of a bacon, egg and cheese breakfast bagel, let alone write out the recipe when all of the ingredients are in the title?" I reply, "Sure, it's pretty self explanatory, but doesn't it make the page pop?" I think this book - currently housing about 40 recipes with plenty of room for more - is going to help me stay organized in the kitchen and preserve some of my favorite recipes. It also reminded me of a few I haven't broken out in years and helped plan my next couple weeks for meals! I thought I'd share one of my favorites here, which also happens to be one of the easiest. I grabbed this from allrecipes.com last year when I was searching for an easy mac and cheese. Preheat oven to 350. Cook pasta according to directions. Drain and add to casserole dish. Stir in soup, milk and sour cream. Sprinkle with cheese and add bread crumbs over the top for a crunch. Bake at 350 for 25-30 minutes. Our recent houseguest Kara turned us on to a great idea - grilled pizza! We just had to try it ourselves this past weekend and it was so easy to do! We had a few friends over but still had plenty of leftovers since we tried our hands at 3 different pizzas: Mexican, BBQ Chicken and - my usual order - Pepperoni/Black Olives/Mushroom. We bought dough from the Pizza Station at Whole Foods and Bob rolled the three pies using a rolling pin and plenty of flour. Brush each pie with olive oil on one side and throw it on the grill, oiled side down, for only 1-2 minutes with the grill lid closed. Brush uncooked side with olive oil and flip over. Add your toppings to the cooked side - making sure to use toppings that don't need to be pre-cooked - and grill for another minute or two. Remove from the direct heat, close the grill and cook a bit longer. We had a bit of a crisis when the gas in the grill ran out halfway through the process, but thanks to some generous neighbors, dinner was saved! They will definitely be getting some "thank you" brownies! 1/2 sleeve pepperoni - or however much you want! Spread sauce over pizza crust. Add remaining ingredients and top with cheese! Bring chicken, BBQ, honey, molasses, brown sugar and cilantro to a boil and remove from heat. Spread over crust, topping with onion and gouda. Spread beans on crust, add cheese and pepper. Bake/Grill. Add lettuce and tomato just before serving. The crust for the BBQ chicken pizza was a little wider than our sauce would stretch, so we cut off a chunk. We thought it might end up being a mini pepperoni, but we decided to try breadsticks! We brushed it with olive oil, added some garlic and a hefty amount of parmesan cheese. They grilled about the same amount of time as the pizzas and were delicious! All in all, a great summer night eating dinner with friends on the balcony. . .and a great rest of the weekend eating the leftovers and not having to think about what to make!